27-Mar-2019 is Shopee Mega Day. The 27.3 Shopee Mega Sale campaign promises seven days of highly attractive deals across all categories. Taking place from 21 to 27 March, the mega sale offers free shipping with a minimum RM27 spent, daily ‘Tikam’ with RM1 and RM1 million worth of cash and prizes to be won with Shopee Quiz. The platform will also have special themed-days with discounts up to 90%, RM8mil worth of vouchers up for grabs and daily Shocking Sale with Lowest Price Guaranteed items as well as social media giveaways. 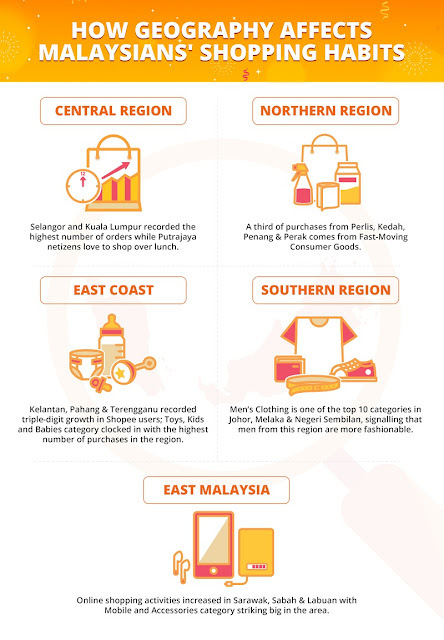 Shopee, the leading e-commerce platform in Southeast Asia and Taiwan, is seeing an interesting pattern unfold among Malaysians through its data as it dissects shoppers’ behaviours across 13 states and 3 federal territories, with each state and federal territories provide surprising insights. With a majority of Malaysia’s population now on Shopee, such data has allowed Shopee to understand the shopping habits of Malaysians, and hence curate campaigns fitting for all walks of life. 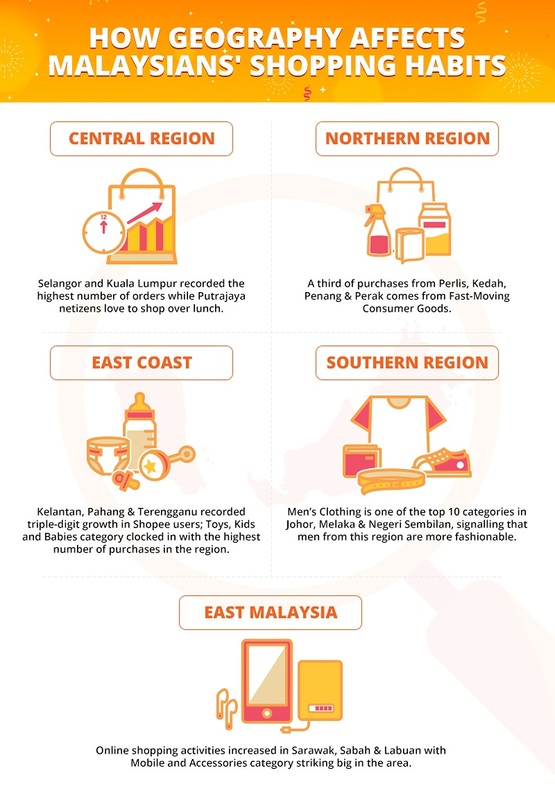 With around 16 million downloads, Shopee is seeing an interesting pattern unfold among Malaysians through its data as it dissects shoppers’ behaviours across 13 states and 3 federal territories. As Greater Klang Valley is the most populated urban area, Selangor and Kuala Lumpur top the country with the highest number of orders recorded. We also noted that while most Malaysians favour shopping between 9pm and 11pm, netizens in Putrajaya prefer to do their shopping during lunch. Online shopping activities are rising in Perlis, Kedah, Penang and Perak; with around a third of purchases from these four states coming from the Fast-Moving Consumer Goods (FMCG) category which includes products such as toiletries. Shopee’s Shocking Sale, Shopee Coins and key campaigns help consumers stretch their Ringgit where buyers can enjoy savings of up to a quarter of the retail price for FMCG products on the platform. Shopee recorded a triple-digit growth in the number of new users from Kelantan, Pahang and Terengganu, signalling an increased adoption of e-commerce which is likely driven by the growing affordability of smartphones and Internet data plans. The Toys, Kids and Babies category has the highest number of purchases in these three states; diapers, baby rompers, playmats and breast pumps being the most sought-after items. Johor, Melaka and Negeri Sembilan saw an increment in the number of Shopee users, with more of them being males. The Men’s Clothing category is one of the top categories as compared to other states, with men checking out items like floral shirts, bomber and leather jackets, and blazers, signalling that men from the southern region are more fashionable. Shopee’s nationwide free shipping programme removes geographical barriers, so products are now available in places where brands may have little or no retail presence. As a result, online shopping activities are buzzing across the South China Sea. The Mobile and Accessories category is a hit in Sarawak, Sabah and Labuan. To illustrate, over 51,000 units of power banks were ordered across three months. Digi prepaid reloads are also seen to be a hit amongst East Malaysians. The reloads were made more attractive with a 10% bonus credit given to users.